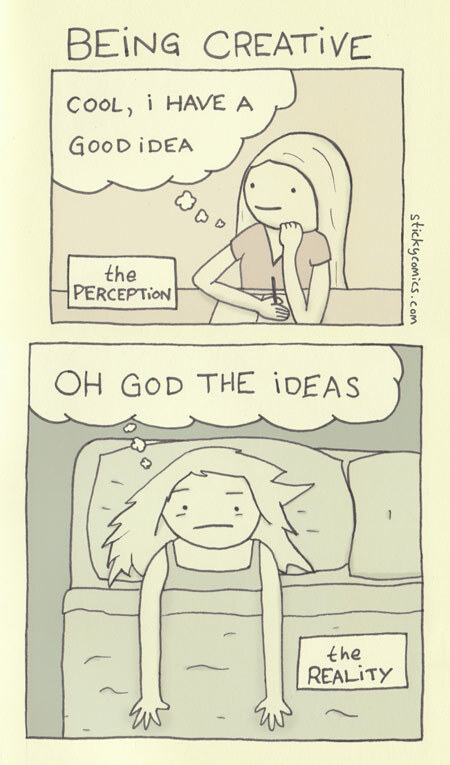 Ideas are those rude next door neighbors who come home the middle of the night and keep you awake throwing wild parties that you could not possibly enjoy because you are already in bed and too tired anyway after your own long humdrum day of not actually accomplishing much. This comic is on GoComics, you can buy a print over there! This is pretty much accurate. An idea is like a small baby. It just won’t let you sleep lol. This has been my life so many times but last night it was just awful. 3 AM. I couldn’t get to sleep till 3 am. I finally had to get up and just write it all down, even tho I knew I wasn’t going to forget it because it was all stuff that really happened I just wanted to tell people. So awful. What a nightmare.